Addressing the growing demand for larger capacity in information technology, VLSI Micro- and Nanophotonics: Science, Technology, and Applications explores issues of science and technology of micro/nano-scale photonics and integration for broad-scale and chip-scale Very Large Scale Integration photonics. This book is a game-changer in the sense that it is quite possibly the first to focus on "VLSI Photonics". Very little effort has been made to develop integration technologies for micro/nanoscale photonic devices and applications, so this reference is an important and necessary early-stage perspective on this field. 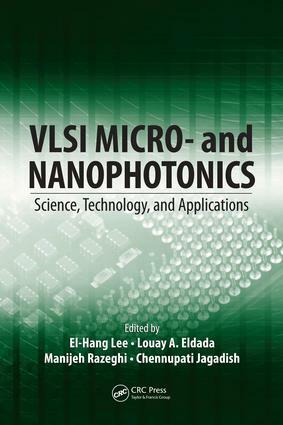 New demand for VLSI photonics brings into play various technological and scientific issues, as well as evolutionary and revolutionary challenges—all of which are discussed in this book. These include topics such as miniaturization, interconnection, and integration of photonic devices at micron, submicron, and nanometer scales. With its "disruptive creativity" and unparalleled coverage of the photonics revolution in information technology, this book should greatly impact the future of micro/nano-photonics and IT as a whole. It offers a comprehensive overview of the science and engineering of micro/nanophotonics and photonic integration. Many books on micro/nanophotonics focus on understanding the properties of individual devices and their related characteristics. However, this book offers a full perspective from the point of view of integration, covering all aspects of benefits and advantages of VLSI-scale photonic integration—the key technical concept in developing a platform to make individual devices and components useful and practical for various applications.